Custom-fit and optimized catheter trajectories keep a consistent SSD even over the most complex anatomy. High Dose Rate (HDR) surface brachytherapy is a technique used to treat various types of skin lesions including basal and squamous cell carcinoma. Adaptiiv (3D Bolus) offers a patient specific alternative to the traditional practice of treating skin cancer using HDR brachytherapy. Traditional applicators are generic, coming in either circular (Leipzig) or square (Freiburg Flap) geometries. With Freiburg Flaps, it is very difficult to conform the applicator to irregular locations on the body, such as the face or scalp. 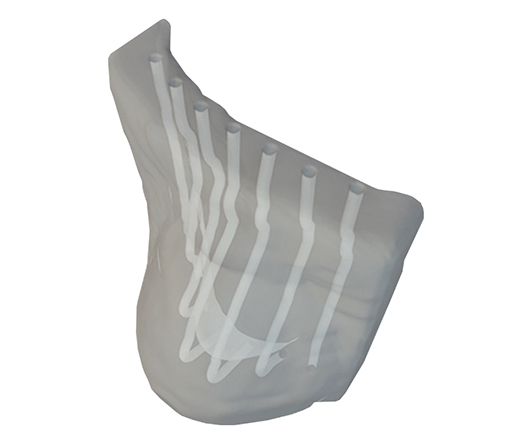 Adaptiiv (3D Bolus) software allows the user to create a structure of uniform thickness within the treatment planning system that follows the contours of each individual patient. Our custom algorithm generates potential catheter positions within the structure itself at a uniform distance from source to the surface of the patient. The software then performs a subtraction operator to create hollow trajectories to allow the free movement of the radioactive source through the applicator. The catheter tunnels are printed directly within the applicator itself, eliminating the need to drill in tunnels post print. 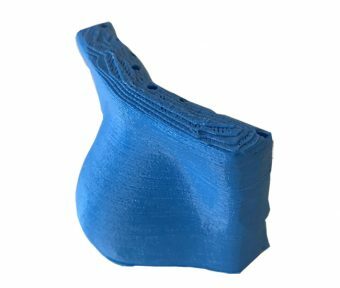 The 3D printed applicator, since it was designed from the patients CT scan, fits to the unique curves of each patient. radiation and see the resulting distribution in real time. the next fraction of treatment.